So many beautiful ideas, and very affordable. The jewelry industry has really responded to the economic struggles with everyday jewelry that is very well priced. Fashion jewelry has exploded with new and exciting ideas. There's a surprise coming Friday, November 26th! A limited edition bead that will only be available beginning November 25th until supplies last! It's such a secret, there are no pictures or information! So, before you go to the mall to your shopping frenzied day, stop here first! Officina Bernardi - Yes, straight from Italy this is an actual Italian family whose jewelry designs were introduced in 1987, but have entered the US market in just the last few years. 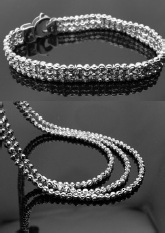 They have a remarkable patented faceted bead that is platinum and rhodium plated, making it look just like a diamond. The sparkle is amazing! 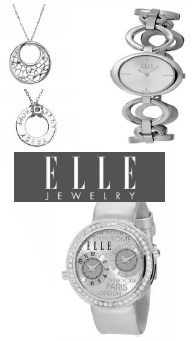 ELLE Jewelry and ELLE Time fit any style, is precisely polished and rhodium plated. Look for the red and white display in the wall. You will love the style! Iddeal Star is difficult to put into words. This 14K white gold diamond jewelry will amaze you. By taking a large diamond, surrounding it with small diamonds, precisely set, gives the effect of one LARGE diamond. We've had cluster rings in the past, but this is by far the most gorgeous! Stocking Stuffer ideas? Off the cuff bracelets fit any wrist, birthstone earrings, freshwater pearls, and Sterling Silver earrings starting at just $9.95!!! !